We may never know. I suppose the problem is when you're literally "bored to death," the whole dying thing gets in the way of letting others know about it. But a modern day study in England may provide a little more understanding surrounding this overly dramatic turn of phrase. According to Todd B. Kashdan, Ph.D., over 7,500 London citizens between the ages of 35 and 55 were interviewed during the late 1980's. One of the questions they were asked was whether or not they felt bored at work during the past month. Then, 20 years later, those same people were tracked down to see if they were still alive. Researchers found that those who reported being bored were 2.5 times more likely to die of heart problems than those who hadn't. Still, the point is boredom and the behavior surrounding it can be dangerous! 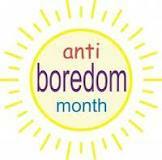 Which is why I thought it important to point out that July is National Anti-Boredom Month. It's also the reason I have dedicated this month's "Things I'm Gonna Do This Week" to leading the crusade against that form of torture sometimes more inhumane than waterboarding: feeling bored. We've all felt it. Even when there's plenty to do, boredom can sneak up on you and make you and your mundane tasks feel even more, well…mundane. But boredom doesn't always necessarily refer to what you're doing so much as how you feel about yourself when you're doing it. So, that's what I'm gonna do this week. Not only will I pay extra attention to what I'm doing, but also to how I feel about myself when I'm doing it. That, and I might go skydiving.